Editor’s note: This guest post was written by Kris Duggan, CEO and founder of Badgeville, which launched at TechCrunch Disrupt San Francisco in September 2010. Prior to founding Badgeville, Duggan held positions at Socialtext and WebEx. I was honored to have been selected to launch my social rewards and analytics company, Badgeville, this past September at TechCrunch Disrupt. Badgeville made it to the final round of the Startup Battlefield and won the Audience Choice Award. As a result of our success at TechCrunch, we’ve had the opportunity and good fortune of selling over $1 million in Web-based software, securing 25 clients with 1 billion monthly page views, raising $2.5 million in series A funding, and growing our team from five to 20 people with three offices around the world. In the first 30 days following Disrupt, our website received 20,000 visitors, often with over 1,000 visitors per day. We were impressed and, at times, overwhelmed by the amount of qualified leads we received as a direct result of the publicity spurred by the event. Since then, when I first meet an entrepreneur, they are frequently interested in the key factors that contributed to Badgeville’s successful launch. I thought it might be helpful for others to consider our story when evaluating their options when it comes to introducing their companies to the world. They say that bad speakers think about themselves during a presentation, good speakers think about the content, and the best speakers think about their audience. The evolution from bad to great begins with comfort and practice. The number of practice opportunities Heather and the team provided to us—at a few VC offices about a month before the event, and then even at the conference hall the week before—were critical to gaining the skills required to deliver a successful presentation. It makes an immeasurable difference when you can see how different people react to your message and what they suggest you remove or reinforce. Each of the companies had only 6 minutes to present, including time for a live demo, making every second critical when trying to communicate your story. My co-founder Wedge Martin and I practiced our presentation over 100 times. We presented to all our friends and family and tried to perform it as if we were in front of thousands of live people and tens of thousands of streaming participants. In the end, we became comfortable with the content and could begin to focus on the audience. What we realized, after talking to hundreds of web managers, marketing managers, brand managers and other potential customers, is that “game mechanics” alone is not the right message. It’s only part of the message. The umbrella messaging about social loyalty, which is the heart of our company, is much larger than that, and our messaging needed to clearly represent the bigger picture of engagement. After a few more revisions and research cycles, we came up with better messaging that resonated with our target audience. It started out by framing Badgeville as “a modern loyalty platform for mobile and web publishers to increase engagement with their audience.” Then we mentioned the “proven techniques from social gaming” that we fold into the mix. The key learning here is that you must carefully craft your messaging at launch. I’ve seen lots of really cool technology startups miss the mark because their messaging doesn’t clearly resonate. Note: the messaging can evolve after launch, of course, but it’s important to have a clear message that resonates with your audience from the start. During our customer development and discovery efforts over the summer, we were fortunate enough to sign up a great collection of initial customers. In order to show proof of the traction for our business onstage, we were able to share that we had $500,000 in bookings prior to launch with major brands such as Comcast Sports, Philly.com, The Next Web, Black Book Media, and others. Some found our level of transparency about our company financials unique and interesting for such a young company. The judges (Kevin Rose, Ron Conway, Marissa Mayer, and others) appreciated that we were able to show clear evidence of a market and proof that our product is desired by customers. Their feedback and input was invaluable. I believe that our revenue, customers, and traction were the factors that propelled us into the next stage of the contest. We were no longer just a good idea, we were on our way to becoming a business. We had gotten all the way to Disrupt with our customers and our product, a lean team of 5, and only $250,000 in seed capital, which made us the least-funded startup vying for the title of TechCrunch Disrupt Winner. In the following three months after the conference, we received over 2,500 leads through our website. Many were people downloading our whitepaper and many were contacting us directly for more information. However, we didn’t have the team in place to deal with that influx of interest. For some companies, it might mean turning on a self-service option. For us, we were very focused on making sure we could take on specific projects with clients where we felt we could really leverage our platform. As a result, everyone in the company spoke with prospective clients in order to see where we thought the best fit was. Interestingly enough, we hadn’t formulated a formal pricing structure at time of launch. Much of our initial selling activities post-launch focused on creating an optimal plan for our customers and our company. Since then, we’ve added a few measures to alleviate this strain; we’ve added more sales people now in the Western region, the Eastern region (we opened a NY office), and in Europe (Amsterdam office). We also added sales focus specifically on the media and entertainment vertical. We launched with a couple of key deployments of our software platform in place. However, we know there is a huge potential to enhance our product over the coming year. Today, we estimate our product is only about 10% complete. We are going to great lengths to make our widgets as flexible and configurable as possible, deeper into the host of social game mechanics we make available in our platform, and even deeper still into the analytics side of how we identify and segment user loyalty across our client communities. There is a balance I imagine between getting it perfect, and launching and iterating. We’ve also learned a lot from talking with clients about capabilities they value, and we never would have had this volume of data and input without having launched. #3 – Are we ready for capital? Several VCs and angel investors approached us during the event with a variety of enticing and exciting proposals. It is very alluring to get that much follow up and interest after all of your hard work. Our belief was that we weren’t ready to take capital at our launch; we hadn’t even formulated a real operating plan. We spent a few months post-launch getting to know investors we could really trust and made sure they understood the kind of company we are trying to build. Having options generated from the conference helped us practice and even make some mistakes in financing. In the end, we were able to solidify some great support from both angel (thank you Maynard Webb, Joe Lonsdale, Zain Khan, Pejman Nozad, and others) and institutional investors (thank you Trinity Ventures, El Dorado Ventures). Without Disrupt, we absolutely would not have hit key milestones in the accelerated timeframe that we have been able to achieve. While we had some initial customer traction, Disrupt solidified that for us and proved to be an amazing and uniquely distinct launching opportunity. In terms of recruiting, we’ve been able to grow to a total of 20 people on our team over the last few months because of our traction. In terms of access to capital, this traction also meant we were able to secure our funding. Thank you Mike, Heather, Erick, and the rest of the TC team. We would not be where we are today without the opportunities you have provided us. 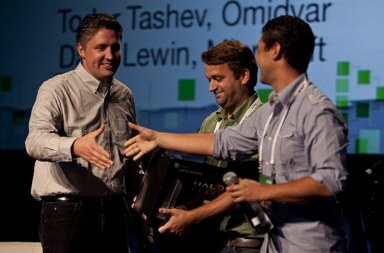 And congrats to Qwiki the actual winner of Disrupt SF 2010 who recently announced a large institutional round of investment after unveiling their killer product at Disrupt!